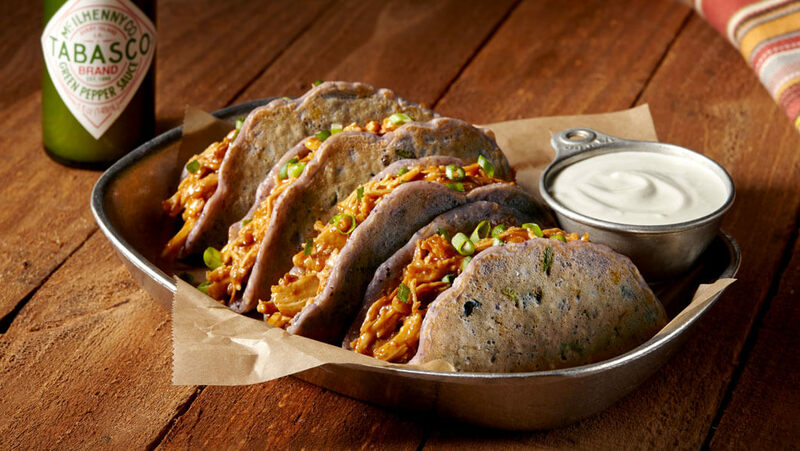 This isn’t your ordinary taco recipe: Blue Cornmeal Tacos wrap flavorful pulled chicken in a homemade corn-and-bean tortilla. Eggs, cracked --- 3 ea. Baking soda --- 1 tsp. Smoked chicken, pulled --- 1 qt. Combine cornmeal, corn, beans, green onions, eggs, baking soda and flour. Mix and slowly add buttermilk and TABASCO® Green Sauce, a little at a time, until the mixture is as thick as pancake batter. You might not need all the buttermilk. Preheat a griddle; cook 12 pancakes with the batter. Heat barbecue sauce and pulled chicken together. Place an equal amount onto each pancake.